Cytochromes P450 (CYPs) are proteins of the superfamily containing heme as a cofactor and, therefore, are hemoproteins. CYPs use a variety of small and large molecules as substrates in enzymatic reactions. They are, in general, the terminal oxidase enzymes in electron transfer chains, broadly categorized as P450-containing systems. The term "P450" is derived from the spectrophotometric peak at the wavelength of the absorption maximum of the enzyme (450 nm) when it is in the reduced state and complexed with carbon monoxide. CYP enzymes have been identified in all kingdoms of life: animals, plants, fungi, protists, bacteria, archaea, and even in viruses. However, they are not omnipresent; for example, they have not been found in Escherichia coli. More than 50,000 distinct CYP proteins are known. Microsomal P450 systems, in which electrons are transferred from NADPH via cytochrome P450 reductase (variously CPR, POR, or CYPOR). Cytochrome b5 (cyb5) can also contribute reducing power to this system after being reduced by cytochrome b5 reductase (CYB5R). Mitochondrial P450 systems, which employ adrenodoxin reductase and adrenodoxin to transfer electrons from NADPH to P450. Bacterial P450 systems, which employ a ferredoxin reductase and a ferredoxin to transfer electrons to P450. CYB5R/cyb5/P450 systems, in which both electrons required by the CYP come from cytochrome b5. FMN/Fd/P450 systems, originally found in Rhodococcus species, in which a FMN-domain-containing reductase is fused to the CYP. P450 only systems, which do not require external reducing power. Notable ones include thromboxane synthase (CYP5), prostacyclin synthase (CYP8), and CYP74A (allene oxide synthase). Many hydroxylation reactions (insertion of hydroxyl groups) use CYP enzymes. Genes encoding CYP enzymes, and the enzymes themselves, are designated with the root symbol CYP for the superfamily, followed by a number indicating the gene family, a capital letter indicating the subfamily, and another numeral for the individual gene. The convention is to italicise the name when referring to the gene. For example, CYP2E1 is the gene that encodes the enzyme CYP2E1—one of the enzymes involved in paracetamol (acetaminophen) metabolism. The CYP nomenclature is the official naming convention, although occasionally CYP450 or CYP450 is used synonymously. However, some gene or enzyme names for CYPs may differ from this nomenclature, denoting the catalytic activity and the name of the compound used as substrate. Examples include CYP5A1, thromboxane A2 synthase, abbreviated to TBXAS1 (ThromBoXane A2 Synthase 1), and CYP51A1, lanosterol 14-α-demethylase, sometimes unofficially abbreviated to LDM according to its substrate (Lanosterol) and activity (DeMethylation). The current nomenclature guidelines suggest that members of new CYP families share at least 40% amino acid identity, while members of subfamilies must share at least 55% amino acid identity. There are nomenclature committees that assign and track both base gene names (Cytochrome P450 Homepage) and allele names (CYP Allele Nomenclature Committee). The "Fe(V) intermediate" at the bottom left is a simplification: it is an Fe(IV) with a radical heme ligand. Substrate binds in proximity to the heme group, on the side opposite to the axial thiolate. Substrate binding induces a change in the conformation of the active site, often displacing a water molecule from the distal axial coordination position of the heme iron, and changing the state of the heme iron from low-spin to high-spin. Substrate binding induces electron transfer from NAD(P)H via cytochrome P450 reductase or another associated reductase. Molecular oxygen binds to the resulting ferrous heme center at the distal axial coordination position, initially giving a dioxygen adduct not unlike oxy-myoglobin. A second electron is transferred, from either cytochrome P450 reductase, ferredoxins, or cytochrome b5, reducing the Fe-O2 adduct to give a short-lived peroxo state. The peroxo group formed in step 4 is rapidly protonated twice, releasing one molecule of water and forming the highly reactive species referred to as P450 Compound 1 (or just Compound I). This highly reactive intermediate was isolated in 2010, P450 Compound 1 is an iron(IV) oxo (or ferryl) species with an additional oxidizing equivalent delocalized over the porphyrin and thiolate ligands. Evidence for the alternative perferryl iron(V)-oxo  is lacking. Depending on the substrate and enzyme involved, P450 enzymes can catalyze any of a wide variety of reactions. A hypothetical hydroxylation is shown in this illustration. After the product has been released from the active site, the enzyme returns to its original state, with a water molecule returning to occupy the distal coordination position of the iron nucleus. Oxygen rebound mechanism utilized by cytochrome P450 for conversion of hydrocarbons to alcohols via the action of "compound I", an iron(IV) oxide bound to a heme radical cation. An alternative route for mono-oxygenation is via the "peroxide shunt" (path "S" in figure). This pathway entails oxidation of the ferric-substrate complex with oxygen-atom donors such as peroxides and hypochlorites. A hypothetical peroxide "XOOH" is shown in the diagram. Binding of substrate is reflected in the spectral properties of the enzyme, with an increase in absorbance at 390 nm and a decrease at 420 nm. This can be measured by difference spectrometry and is referred to as the "type I" difference spectrum (see inset graph in figure). Some substrates cause an opposite change in spectral properties, a "reverse type I" spectrum, by processes that are as yet unclear. Inhibitors and certain substrates that bind directly to the heme iron give rise to the type II difference spectrum, with a maximum at 430 nm and a minimum at 390 nm (see inset graph in figure). If no reducing equivalents are available, this complex may remain stable, allowing the degree of binding to be determined from absorbance measurements in vitro C: If carbon monoxide (CO) binds to reduced P450, the catalytic cycle is interrupted. This reaction yields the classic CO difference spectrum with a maximum at 450 nm. Human CYPs are primarily membrane-associated proteins located either in the inner membrane of mitochondria or in the endoplasmic reticulum of cells. CYPs metabolize thousands of endogenous and exogenous chemicals. Some CYPs metabolize only one (or a very few) substrates, such as CYP19 (aromatase), while others may metabolize multiple substrates. Both of these characteristics account for their central importance in medicine. Cytochrome P450 enzymes are present in most tissues of the body, and play important roles in hormone synthesis and breakdown (including estrogen and testosterone synthesis and metabolism), cholesterol synthesis, and vitamin D metabolism. Cytochrome P450 enzymes also function to metabolize potentially toxic compounds, including drugs and products of endogenous metabolism such as bilirubin, principally in the liver. The Human Genome Project has identified 57 human genes coding for the various cytochrome P450 enzymes. Proportion of antifungal drugs metabolized by different families of CYPs. CYPs are the major enzymes involved in drug metabolism, accounting for about 75% of the total metabolism. Most drugs undergo deactivation by CYPs, either directly or by facilitated excretion from the body. Also, many substances are bioactivated by CYPs to form their active compounds. Many drugs may increase or decrease the activity of various CYP isozymes either by inducing the biosynthesis of an isozyme (enzyme induction) or by directly inhibiting the activity of the CYP (enzyme inhibition). This is a major source of adverse drug interactions, since changes in CYP enzyme activity may affect the metabolism and clearance of various drugs. For example, if one drug inhibits the CYP-mediated metabolism of another drug, the second drug may accumulate within the body to toxic levels. Hence, these drug interactions may necessitate dosage adjustments or choosing drugs that do not interact with the CYP system. Such drug interactions are especially important to take into account when using drugs of vital importance to the patient, drugs with important side-effects and drugs with small therapeutic windows, but any drug may be subject to an altered plasma concentration due to altered drug metabolism. A classical example includes anti-epileptic drugs. Phenytoin, for example, induces CYP1A2, CYP2C9, CYP2C19, and CYP3A4. Substrates for the latter may be drugs with critical dosage, like amiodarone or carbamazepine, whose blood plasma concentration may either increase because of enzyme inhibition in the former, or decrease because of enzyme induction in the latter. Naturally occurring compounds may also induce or inhibit CYP activity. For example, bioactive compounds found in grapefruit juice and some other fruit juices, including bergamottin, dihydroxybergamottin, and paradicin-A, have been found to inhibit CYP3A4-mediated metabolism of certain medications, leading to increased bioavailability and, thus, the strong possibility of overdosing. Because of this risk, avoiding grapefruit juice and fresh grapefruits entirely while on drugs is usually advised. Saint-John's wort, a common herbal remedy induces CYP3A4, but also inhibits CYP1A1, CYP1B1, and CYP2D6. At relatively high concentrations, starfruit juice has also been shown to inhibit CYP2A6 and other CYPs. Watercress is also a known inhibitor of the cytochrome P450 CYP2E1, which may result in altered drug metabolism for individuals on certain medications (e.g., chlorzoxazone). Tributyltin has been found to inhibit the function of cytochrome P450, leading to masculinization of mollusks. Goldenseal, with its two notable alkaloids berberine and hydrastine, has been shown to alter P450-marker enzymatic activities (involving CYP2C9, CYP2D6, and CYP3A4). Steroidogenesis, showing many of the enzyme activities that are performed by cytochrome P450 enzymes. HSD: Hydroxysteroid dehydrogenase. CYP11A1 (also known as P450scc or P450c11a1) in adrenal mitochondria affects "the activity formerly known as 20,22-desmolase" (steroid 20α-hydroxylase, steroid 22-hydroxylase, cholesterol side-chain scission). Certain cytochrome P450 enzymes are critical in metabolizing polyunsaturated fatty acids (PUFAs) to biologically active, intercellular cell signaling molecules (eicosanoids) and/or metabolize biologically active metabolites of the PUFA to less active or inactive products. These CYPs possess cytochrome P450 omega hydroxylase and/or epoxygenase enzyme activity. CYP1A1, CYP1A2, and CYP2E1 metabolize endogenous PUFAs to signaling molecules: they metabolize arachidonic acid (i.e. AA) to 19-hydroxyeicosatetraenoic acid (i.e. 19-HETE; see 20-hydroxyeicosatetraenoic acid); eicosapentaenoic acid (i.e. EPA) to epoxyeicosatetraenoic acids (i.e. EEQs); and docosahexaenoic acid (i.e. DHA) to epoxydocosapentaenoic acids (i.e. EDPs). CYP2C8, CYP2C9, CYP2C18, CYP2C19, and CYP2J2 metabolize endogenous PUFAs to signaling molecules: they metabolize AA to epoxyeicosatetraenoic acids (i.e. EETs); EPA to EEQs; and DHA to EDPs. CYP2S1 metabolizes PUFA to signaling molecules: it metabolizes AA to EETs ad EPA to EEQs. CYP3A4 metabolizes AA to EET signaling molecules. CYP4A11 metabolizes endogenous PUFAs to signaling molecules: it metabolizes AA to 20-HETE and EETs; it also hydroxylates DHA to 22-hydroxy-DHA (i.e. 12-HDHA). CYP4F2, CYP4F3A, and CYP4F3B (see CYP4F3 for latter two CYPs) metabolize PUFAs to signaling molecules: they metabolizes AA to 20-HETE. They also metabolize EPA to 19-hydroxyeicosapentaenoic acid (19-HEPE) and 20-hydroxyeicosapentaenoic acid (20-HEPE) as well as metabolize DHA to 22-HDA. They also inactivate or reduce the activity of signaling molecules: they metabolize leukotriene B4 (LTB4) to 20-hydroxy-LTB4, 5-hydroxyeicosatetraenoic acid (5-HETE) to 5,20-diHETE, 5-oxo-eicosatetraenoic acid (5-oxo-ETE) to 5-oxo,20-hydroxy-ETE, 12-hydroxyeicosatetraenoic acid (12-HETE) to 12,20-diHETE, EETs to 20-hydroxy-EETs, and lipoxins to 20-hydroxy products. CYP4F8 and CYP4F12 metabolize PUFAs to signaling molecules: they metabolizes EPA to EEQs and DHA to EDPs. They also metabolize AA to 18-hydroxyeicosatetraenoic acid (18-HETE) and 19-HETE. CYP4F11 inactivates or reduces the activity of signaling molecules: it metabolizes LTB4 to 20-hydroxy-LTB4, (5-HETE) to 5,20-diHETE, (5-oxo-ETE) to 5-oxo,20-hydroxy-ETE, (12-HETE) to 12,20-diHETE, EETs to 20-hydroxy-EETs, and lipoxins to 20-hydroxy products. CYP4F22 ω-hydroxylates extremely long "very long chain fatty acids", i.e. fatty acids that are 28 or more carbons long. The ω-hydroxylation of these special fatty acids is critical to creating and maintaining the skins water barrier function; autosomal recessive inactivating mutations of CYP4F22 are associated with the Lamellar ichthyosis subtype of Congenital ichthyosiform erythrodema in humans. Many animals have as many or more CYP genes than humans do. Reported numbers range from 35 genes in the sponge Amphimedon queenslandica to 235 genes in the cephalochordate Branchiostoma floridae. Mice have genes for 101 CYPs, and sea urchins have even more (perhaps as many as 120 genes). Most CYP enzymes are presumed to have monooxygenase activity, as is the case for most mammalian CYPs that have been investigated (except for, e.g., CYP19 and CYP5). Gene and genome sequencing is far outpacing biochemical characterization of enzymatic function, though many genes with close homology to CYPs with known function have been found, giving clues to their functionality. The classes of CYPs most often investigated in non-human animals are those either involved in development (e.g., retinoic acid or hormone metabolism) or involved in the metabolism of toxic compounds (such as heterocyclic amines or polyaromatic hydrocarbons). Often there are differences in gene regulation or enzyme function of CYPs in related animals that explain observed differences in susceptibility to toxic compounds (ex. canines inability to metabolize xanthines such as caffeine). Some drugs undergo metabolism in both species via different enzymes, resulting in different metabolites, while other drugs are metabolized in one species but excreted unchanged in another species. For this reason, one species's reaction to a substance is not a reliable indication of the substance's effects in humans. CYPs have been extensively examined in mice, rats, dogs, and less so in zebrafish, in order to facilitate use of these model organisms in drug discovery and toxicology. Recently CYPs have also been discovered in avian species, in particular turkeys, that may turn out to be a great model for cancer research in humans. CYP1A5 and CYP3A37 in turkeys were found to be very similar to the human CYP1A2 and CYP3A4 respectively, in terms of their kinetic properties as well as in the metabolism of aflatoxin B1. CYPs have also been heavily studied in insects, often to understand pesticide resistance. For example, CYP6G1 is linked to insecticide resistance in DDT-resistant Drosophila melanogaster and CYP6Z1 in the mosquito malaria vector Anopheles gambiae is capable of directly metabolizing DDT. Microbial cytochromes P450 are often soluble enzymes and are involved in diverse metabolic processes. In bacteria the distribution of P450s is very variable with many bacteria having no identified P450s (e.g. E.coli). Some bacteria, predominantly actinomycetes, have numerous P450s (e.g.,). Those so far identified are generally involved in either biotransformation of xenobiotic compounds (e.g. CYP105A1 from Streptomyces griseolus metabolizes sulfonylurea herbicides to less toxic derivatives,) or are part of specialised metabolite biosynthetic pathways (e.g. CYP170B1 catalyses production of the sesquiterpenoid albaflavenone in Streptomyces albus,). Although no P450 has yet been shown to be essential in a microbe, the CYP105 family is highly conserved with a representative in every streptomycete genome sequenced so far (). Due to the solubility of bacterial P450 enzymes, they are generally regarded as easier to work with than the predominantly membrane bound eukaryotic P450s. This, combined with the remarkable chemistry they catalyse, has led to many studies using the heterologously expressed proteins in vitro. Few studies have investigated what P450s do in vivo, what the natural substrate(s) are and how P450s contribute to survival of the bacteria in the natural environment.Three examples that have contributed significantly to structural and mechanistic studies are listed here, but many different families exist. Cytochrome P450cam (CYP101) originally from Pseudomonas putida has been used as a model for many cytochromes P450 and was the first cytochrome P450 three-dimensional protein structure solved by X-ray crystallography. This enzyme is part of a camphor-hydroxylating catalytic cycle consisting of two electron transfer steps from putidaredoxin, a 2Fe-2S cluster-containing protein cofactor. Cytochrome P450 119 (CYP119) isolated from the thermophillic archea Sulfolobus acidocaldarius  has been used in a variety of mechanistic studies. Because thermophillic enzymes evolved to function at high temperatures, they tend to function more slowly at room temperature (if at all) and are therefore excellent mechanistic models. Significant research is ongoing into fungal P450s, as a number of fungi are pathogenic to humans (such as Candida yeast and Aspergillus) and to plants. Cunninghamella elegans is a candidate for use as a model for mammalian drug metabolism. Plant cytochrome P450s are involved in a wide range of biosynthetic reactions and target a diverse range of biomolecules. These reactions lead to various fatty acid conjugates, plant hormones, secondary metabolites, lignins, and a variety of defensive compounds. Plant genome annotations suggest that cytochrome P450 genes make up as much as 1% of the plant genes. The number and diversity of P450 genes is responsible, in part, for the multitude of bioactive compounds. The remarkable reactivity and substrate promiscuity of P450s have long attracted the attention of chemists. Recent progress towards realizing the potential of using P450s towards difficult oxidations have included: (i) eliminating the need for natural co-factors by replacing them with inexpensive peroxide containing molecules, (ii) exploring the compatibility of P450s with organic solvents, and (iii) the use of small, non-chiral auxiliaries to predictably direct P450 oxidation. Clozapine, imipramine, paracetamol, phenacetin Heterocyclic aryl amines Inducible and CYP1A2 5-10% deficient oxidize uroporphyrinogen to uroporphyrin (CYP1A2) in heme metabolism, but they may have additional undiscovered endogenous substrates. are inducible by some polycyclic hydrocarbons, some of which are found in cigarette smoke and charred food. These enzymes are of interest, because in assays, they can activate compounds to carcinogens. High levels of CYP1A2 have been linked to an increased risk of colon cancer. Since the 1A2 enzyme can be induced by cigarette smoking, this links smoking with colon cancer. ^ Gonzalez FJ, Gelboin HV (November 1992). "Human cytochromes P450: evolution and cDNA-directed expression". Environmental Health Perspectives. 98: 81–5. PMC 1519618  . PMID 1486867. ^ Lamb DC, Lei L, Warrilow AG, Lepesheva GI, Mullins JG, Waterman MR, Kelly SL (August 2009). "The first virally encoded cytochrome p450". Journal of Virology. 83 (16): 8266–9. doi:10.1128/JVI.00289-09. PMC 2715754  . PMID 19515774. ^ Roland Sigel; Sigel, Astrid; Sigel, Helmut (2007). The Ubiquitous Roles of Cytochrome P450 Proteins: Metal Ions in Life Sciences. New York: Wiley. ISBN 0-470-01672-8. ^ Danielson PB (December 2002). "The cytochrome P450 superfamily: biochemistry, evolution and drug metabolism in humans". 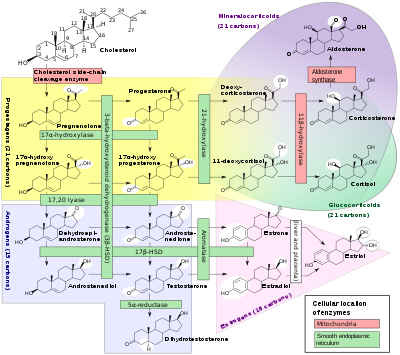 Current Drug Metabolism. 3 (6): 561–97. doi:10.2174/1389200023337054. PMID 12369887. ^ Nelson D. "Cytochrome P450 Homepage". University of Tennessee. Retrieved 2014-11-13. ^ Hanukoglu, Israel (1996). "Electron Transfer Proteins of Cytochrome P450 Systems" (PDF). Advances in Molecular and Cell Biology. Advances in Molecular and Cell Biology. 14: 29–56. doi:10.1016/S1569-2558(08)60339-2. ISBN 9780762301133. ISSN 1569-2558. ^ "NCBI sequence viewer". Retrieved 2007-11-19. ^ a b Meunier B, de Visser SP, Shaik S (September 2004). "Mechanism of oxidation reactions catalyzed by cytochrome p450 enzymes". Chemical Reviews. 104 (9): 3947–80. doi:10.1021/cr020443g. PMID 15352783. ^ Poulos TL, Finzel BC, Howard AJ (June 1987). "High-resolution crystal structure of cytochrome P450cam". Journal of Molecular Biology. 195 (3): 687–700. doi:10.1016/0022-2836(87)90190-2. PMID 3656428. ^ Sligar SG, Cinti DL, Gibson GG, Schenkman JB (October 1979). "Spin state control of the hepatic cytochrome P450 redox potential". Biochemical and Biophysical Research Communications. 90 (3): 925–32. doi:10.1016/0006-291X(79)91916-8. PMID 228675. ^ a b c Rittle J, Green MT (November 2010). "Cytochrome P450 compound I: capture, characterization, and C-H bond activation kinetics". Science. 330 (6006): 933–7. Bibcode:2010Sci...330..933R. doi:10.1126/science.1193478. PMID 21071661. ^ a b Ortiz de Montellano, Paul R.; Paul R. Ortiz de Montellano (2005). Cytochrome P450: structure, mechanism, and biochemistry (3rd ed.). New York: Kluwer Academic/Plenum Publishers. ISBN 0-306-48324-6. ^ Berka K, Hendrychová T, Anzenbacher P, Otyepka M (October 2011). "Membrane position of ibuprofen agrees with suggested access path entrance to cytochrome P450 2C9 active site". The Journal of Physical Chemistry A. 115 (41): 11248–55. Bibcode:2011JPCA..11511248B. doi:10.1021/jp204488j. PMC 3257864  . PMID 21744854. ^ Bailey DG, Dresser GK (2004). "Interactions between grapefruit juice and cardiovascular drugs". American Journal of Cardiovascular Drugs. 4 (5): 281–97. doi:10.2165/00129784-200404050-00002. PMID 15449971. ^ Zeratsky K (2008-11-06). "Grapefruit juice: Can it cause drug interactions?". Ask a food & nutrition specialist. MayoClinic.com. Retrieved 2009-02-09. ^ Chaudhary A, Willett KL (January 2006). "Inhibition of human cytochrome CYP 1 enzymes by flavonoids of St. John's wort". Toxicology. 217 (2–3): 194–205. doi:10.1016/j.tox.2005.09.010. PMID 16271822. ^ Strandell J, Neil A, Carlin G (February 2004). "An approach to the in vitro evaluation of potential for cytochrome P450 enzyme inhibition from herbals and other natural remedies". Phytomedicine. 11 (2–3): 98–104. doi:10.1078/0944-7113-00379. PMID 15070158. ^ Kroon LA (September 2007). "Drug interactions with smoking". American Journal of Health-System Pharmacy. 64 (18): 1917–21. doi:10.2146/ajhp060414. PMID 17823102. ^ Zhang JW, Liu Y, Cheng J, Li W, Ma H, Liu HT, Sun J, Wang LM, He YQ, Wang Y, Wang ZT, Yang L (2007). "Inhibition of human liver cytochrome P450 by star fruit juice". Journal of Pharmacy & Pharmaceutical Sciences. 10 (4): 496–503. doi:10.18433/j30593. PMID 18261370. ^ Leclercq I, Desager JP, Horsmans Y (August 1998). "Inhibition of chlorzoxazone metabolism, a clinical probe for CYP2E1, by a single ingestion of watercress". Clinical Pharmacology and Therapeutics. 64 (2): 144–9. doi:10.1016/S0009-9236(98)90147-3. PMID 9728894. ^ Walmsley, Simon. "Tributyltin pollution on a global scale. An overview of relevant and recent research: impacts and issues" (PDF). WWF UK. ^ Chatterjee P, Franklin MR (November 2003). "Human cytochrome p450 inhibition and metabolic-intermediate complex formation by goldenseal extract and its methylenedioxyphenyl components". Drug Metabolism and Disposition. 31 (11): 1391–7. doi:10.1124/dmd.31.11.1391. PMID 14570772. ^ Häggström, Mikael; Richfield, David (2014). "Diagram of the pathways of human steroidogenesis". WikiJournal of Medicine. 1 (1). doi:10.15347/wjm/2014.005. ISSN 2002-4436. ^ Sugiura K, Akiyama M (July 2015). "Update on autosomal recessive congenital ichthyosis: mRNA analysis using hair samples is a powerful tool for genetic diagnosis". Journal of Dermatological Science. 79 (1): 4–9. doi:10.1016/j.jdermsci.2015.04.009. PMID 25982146. ^ Nelson D (2003). Cytochromes P450 in humans. Retrieved May 9, 2005. ^ Nelson DR, Goldstone JV, Stegeman JJ (February 2013). "The cytochrome P450 genesis locus: the origin and evolution of animal cytochrome P450s". Philosophical Transactions of the Royal Society of London. Series B, Biological Sciences. 368 (1612): 20120474. doi:10.1098/rstb.2012.0474. PMC 3538424  . PMID 23297357. ^ Goldstone JV, Hamdoun A, Cole BJ, Howard-Ashby M, Nebert DW, Scally M, Dean M, Epel D, Hahn ME, Stegeman JJ (December 2006). "The chemical defensome: environmental sensing and response genes in the Strongylocentrotus purpuratus genome". Developmental Biology. 300 (1): 366–84. doi:10.1016/j.ydbio.2006.08.066. PMC 3166225  . PMID 17097629. ^ Rawal S, Kim JE, Coulombe R (December 2010). "Aflatoxin B1 in poultry: toxicology, metabolism and prevention". Research in Veterinary Science. 89 (3): 325–31. doi:10.1016/j.rvsc.2010.04.011. PMID 20462619. ^ Rawal S, Coulombe RA (August 2011). "Metabolism of aflatoxin B1 in turkey liver microsomes: the relative roles of cytochromes P450 1A5 and 3A37". Toxicology and Applied Pharmacology. 254 (3): 349–54. doi:10.1016/j.taap.2011.05.010. PMID 21616088. ^ McCart C, Ffrench-Constant RH (June 2008). "Dissecting the insecticide-resistance- associated cytochrome P450 gene Cyp6g1". Pest Management Science. 64 (6): 639–45. doi:10.1002/ps.1567. PMID 18338338. ^ Chiu TL, Wen Z, Rupasinghe SG, Schuler MA (July 2008). "Comparative molecular modeling of Anopheles gambiae CYP6Z1, a mosquito P450 capable of metabolizing DDT". Proceedings of the National Academy of Sciences of the United States of America. 105 (26): 8855–60. Bibcode:2008PNAS..105.8855C. doi:10.1073/pnas.0709249105. PMC 2449330  . PMID 18577597. ^ McLean KJ, Clift D, Lewis DG, Sabri M, Balding PR, Sutcliffe MJ, Leys D, Munro AW (May 2006). "The preponderance of P450s in the Mycobacterium tuberculosis genome". Trends in Microbiology. 14 (5): 220–8. doi:10.1016/j.tim.2006.03.002. PMID 16581251. ^ Ikeda H, Ishikawa J, Hanamoto A, Shinose M, Kikuchi H, Shiba T, Sakaki Y, Hattori M, Omura S (May 2003). "Complete genome sequence and comparative analysis of the industrial microorganism Streptomyces avermitilis". Nature Biotechnology. 21 (5): 526–31. doi:10.1038/nbt820. PMID 12692562. ^ Leto, O'Keefe (1988). "Identification of constitutive and herbicide inducible cytochromes P-450 in Streptomyces griseolus". Arch Microbiol. 149 (5): 406–12. doi:10.1007/BF00425579. ^ Moody SC, Zhao B, Lei L, Nelson DR, Mullins JG, Waterman MR, Kelly SL, Lamb DC (May 2012). "Investigating conservation of the albaflavenone biosynthetic pathway and CYP170 bifunctionality in streptomycetes". The FEBS Journal. 279 (9): 1640–9. doi:10.1111/j.1742-4658.2011.08447.x. PMID 22151149. ^ Moody SC, Loveridge EJ (December 2014). "CYP105-diverse structures, functions and roles in an intriguing family of enzymes in Streptomyces". Journal of Applied Microbiology. 117 (6): 1549–63. doi:10.1111/jam.12662. PMC 4265290  . PMID 25294646. ^ Narhi LO, Fulco AJ (June 1986). "Characterization of a catalytically self-sufficient 119,000-dalton cytochrome P-450 monooxygenase induced by barbiturates in Bacillus megaterium". The Journal of Biological Chemistry. 261 (16): 7160–9. PMID 3086309. ^ Girvan HM, Waltham TN, Neeli R, Collins HF, McLean KJ, Scrutton NS, Leys D, Munro AW (December 2006). "Flavocytochrome P450 BM3 and the origin of CYP102 fusion species". Biochemical Society Transactions. 34 (Pt 6): 1173–7. doi:10.1042/BST0341173. PMID 17073779. ^ Wright RL, Harris K, Solow B, White RH, Kennelly PJ (April 1996). "Cloning of a potential cytochrome P450 from the archaeon Sulfolobus solfataricus". FEBS Letters. 384 (3): 235–9. doi:10.1016/0014-5793(96)00322-5. PMID 8617361. ^ Vanden Bossche H, Marichal P, Gorrens J, Coene MC (September 1990). "Biochemical basis for the activity and selectivity of oral antifungal drugs". British Journal of Clinical Practice. Supplement. 71: 41–6. PMID 2091733. ^ Schuler MA, Werck-Reichhart D (2003-01-01). "Functional genomics of P450s". Annual Review of Plant Biology. 54 (1): 629–67. doi:10.1146/annurev.arplant.54.031902.134840. PMID 14503006. ^ Mizutani M, Sato F (March 2011). "Unusual P450 reactions in plant secondary metabolism". Archives of Biochemistry and Biophysics. P450 Catalysis Mechanisms. 507 (1): 194–203. doi:10.1016/j.abb.2010.09.026. PMID 20920462. ^ Chefson A, Auclair K (October 2006). "Progress towards the easier use of P450 enzymes". Molecular bioSystems. 2 (10): 462–9. doi:10.1039/b607001a. PMID 17216026. ^ Chefson A, Zhao J, Auclair K (June 2006). "Replacement of natural cofactors by selected hydrogen peroxide donors or organic peroxides results in improved activity for CYP3A4 and CYP2D6". Chembiochem. 7 (6): 916–9. doi:10.1002/cbic.200600006. PMID 16671126. ^ Chefson A, Auclair K (July 2007). "CYP3A4 activity in the presence of organic cosolvents, ionic liquids, or water-immiscible organic solvents". Chembiochem. 8 (10): 1189–97. doi:10.1002/cbic.200700128. PMID 17526062. ^ Petros WP, Younis IR, Ford JN, Weed SA (October 2012). "Effects of tobacco smoking and nicotine on cancer treatment". Pharmacotherapy. 32 (10): 920–31. doi:10.1002/j.1875-9114.2012.01117. PMC 3499669  . PMID 23033231. Gelboin HV, Krausz K (March 2006). "Monoclonal antibodies and multifunctional cytochrome P450: drug metabolism as paradigm". Journal of Clinical Pharmacology. 46 (3): 353–72. doi:10.1177/0091270005285200. PMID 16490812. Gelboin HV, Krausz KW, Gonzalez FJ, Yang TJ (November 1999). "Inhibitory monoclonal antibodies to human cytochrome P450 enzymes: a new avenue for drug discovery" (PDF). Trends in Pharmacological Sciences. 20 (11): 432–8. doi:10.1016/S0165-6147(99)01382-6. PMID 10542439. "Cytochrome P450 Mediated Drug and Carcinogen Metabolism using Monoclonal Antibodies". home.ccr.cancer.gov. Retrieved 2018-04-02. Krausz KW, Goldfarb I, Buters JT, Yang TJ, Gonzalez FJ, Gelboin HV (November 2001). "Monoclonal antibodies specific and inhibitory to human cytochromes P450 2C8, 2C9, and 2C19". Drug Metabolism and Disposition. 29 (11): 1410–23. PMID 11602516. Gonzalez FJ, Gelboin HV (1994). "Role of human cytochromes P450 in the metabolic activation of chemical carcinogens and toxins". Drug Metabolism Reviews. 26 (1-2): 165–83. doi:10.3109/03602539409029789. PMID 8082563. Wikimedia Commons has media related to Cytochrome P450. "Monoclonal Antibodies (MAbs) Define Human Cytochrome P450 Drug Metabolism | Office of Technology Transfer, NIH". www.ott.nih.gov. Retrieved 2018-04-02. Degtyarenko K (2009-01-09). "Directory of P450-containing Systems". International Centre for Genetic Engineering and Biotechnology. Retrieved 2009-02-10. Estabrook RW (December 2003). "A passion for P450s (rememberances of the early history of research on cytochrome P450)". Drug Metabolism and Disposition. 31 (12): 1461–73. doi:10.1124/dmd.31.12.1461. PMID 14625342. Feyereisen R (2005-12-19). "The Insect P450 Site". Institut National de la Recherche Agronomique. Retrieved 2009-02-10. Flockhart DA (2007). "Cytochrome P450 drug interaction table". Indiana University-Purdue University Indianapolis. Retrieved 2009-02-10. Fowler L, Mercer A. "Cytochrome P450 Animated Tutorial". School of Pharmacy, London. Archived from the original on 2016-05-17. Retrieved 2009-02-10. Preissner S (2010). "Cytochrome P450 database". Nucleic Acids Research. Sim SC (2008-09-04). "Human Cytochrome P450 (CYP) Allele Nomenclature Committee". Karolinska Institutet. Retrieved 2009-02-10. Hazai E (2012-02-12). "Cytochrome P450 enzyme-substrate selectivity prediction". Archived from the original on 2011-02-15. Performance of P450 inhibition Studies The performance of in vitro cytochrome P450 inhibition studies including analysis of the data. Sigaroudi A (2018). "A free accessible pharmacokinetic drug interaction table website containing phases I-III". Ali Sigaroudi and Hans Vollbrecht. Retrieved 2018-01-26. Cytochrome P450s are haem-thiolate proteins  involved in the oxidative degradation of various compounds. They are particularly well known for their role in the degradation of environmental toxins and mutagens. They can be divided into 4 classes, according to the method by which electrons from NAD(P)H are delivered to the catalytic site. Sequence conservation is relatively low within the family - there are only 3 absolutely conserved residues - but their general topography and structural fold are highly conserved. The conserved core is composed of a coil termed the 'meander', a four-helix bundle, helices J and K, and two sets of beta-sheets. These constitute the haem-binding loop (with an absolutely conserved cysteine that serves as the 5th ligand for the haem iron), the proton-transfer groove and the absolutely conserved EXXR motif in helix K. While prokaryotic P450s are soluble proteins, most eukaryotic P450s are associated with microsomal membranes. their general enzymatic function is to catalyse regiospecific and stereospecific oxidation of non-activated hydrocarbons at physiological temperatures . Cytochrome P450 enzymes are a superfamily of haem-containing mono-oxygenases that are found in all kingdoms of life, and which show extraordinary diversity in their reaction chemistry. In mammals, these proteins are found primarily in microsomes of hepatocytes and other cell types, where they oxidise steroids, fatty acids and xenobiotics, and are important for the detoxification and clearance of various compounds, as well as for hormone synthesis and breakdown, cholesterol synthesis and vitamin D metabolism. In plants, these proteins are important for the biosynthesis of several compounds such as hormones, defensive compounds and fatty acids. In bacteria, they are important for several metabolic processes, such as the biosynthesis of antibiotic erythromycin in Saccharopolyspora erythraea (Streptomyces erythraeus). Cytochrome P450 enzymes use haem to oxidise their substrates, using protons derived from NADH or NADPH to split the oxygen so a single atom can be added to a substrate. They also require electrons, which they receive from a variety of redox partners. In certain cases, cytochrome P450 can be fused to its redox partner to produce a bi-functional protein, such as with P450BM-3 from Bacillus megaterium [PUBMED:17023115], which has haem and flavin domains. Organisms produce many different cytochrome P450 enzymes (at least 58 in humans), which together with alternative splicing can provide a wide array of enzymes with different substrate and tissue specificities. Individual cytochrome P450 proteins follow the nomenclature: CYP, followed by a number (family), then a letter (subfamily), and another number (protein); e.g. CYP3A4 is the fourth protein in family 3, subfamily A. In general, family members should share >40% identity, while subfamily members should share >55% identity. Cytochrome P450 proteins can also be grouped by two different schemes. One scheme was based on a taxonomic split: class I (prokaryotic/mitochondrial) and class II (eukaryotic microsomes). The other scheme was based on the number of components in the system: class B (3-components) and class E (2-components). These classes merge to a certain degree. Most prokaryotes and mitochondria (and fungal CYP55) have 3-component systems (class I/class B) - a FAD-containing flavoprotein (NAD(P)H-dependent reductase), an iron-sulphur protein and P450. Most eukaryotic microsomes have 2-component systems (class II/class E) - NADPH:P450 reductase (FAD and FMN-containing flavoprotein) and P450. There are exceptions to this scheme, such as 1-component systems that resemble class E enzymes [PUBMED:16042601, PUBMED:15128046, PUBMED:8637843]. The class E enzymes can be further subdivided into five sequence clusters, groups I-V, each of which may contain more than one cytochrome P450 family (eg, CYP1 and CYP2 are both found in group I). The divergence of the cytochrome P450 superfamily into B- and E-classes, and further divergence into stable clusters within the E-class, appears to be very ancient, occurring before the appearance of eukaryotes. For those sequences which have a structure in the Protein DataBank, we use the mapping between UniProt, PDB and Pfam coordinate systems from the PDBe group, to allow us to map Pfam domains onto UniProt sequences and three-dimensional protein structures. The table below shows the structures on which the p450 domain has been found. There are 1669 instances of this domain found in the PDB. Note that there may be multiple copies of the domain in a single PDB structure, since many structures contain multiple copies of the same protein sequence.